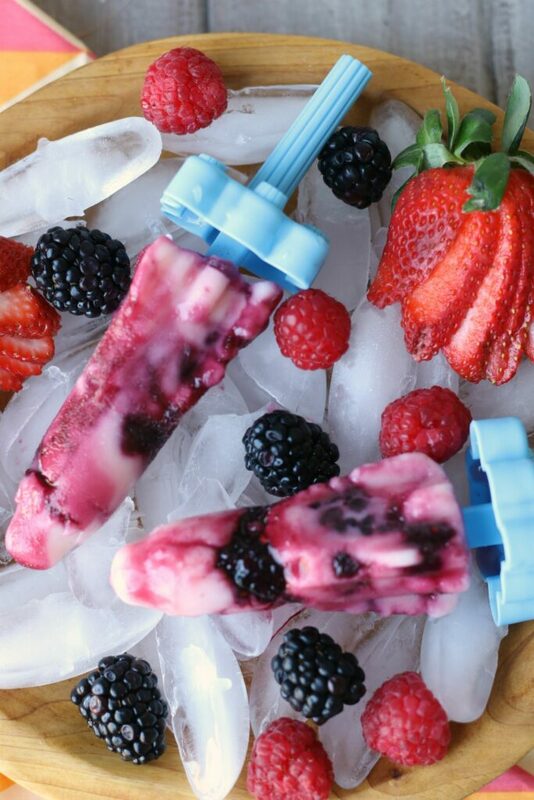 Homemade berry popsicles, simple & refreshing, made with only 4 (real) ingredients. No added sugar, allergy safe, vegan & gluten free. Every time I walk through the frozen section of the grocery store, I catch a glimpse of Berry Popsicles and quickly re-live a moment in my childhood. I use to love, love, love Popsicles. It could be simplest of them all, you know the ones, liquid filled in a clear plastic tube only to be frozen until ready to have the top cut off. Then there were those fun superhero ones, with multiple colors, flavors and shapes that looked like rockets most of the time. Oh, and then there was those push-pops! My mom didn’t buy those often but when she did, oh my goodness! It must be a kid thing, because my kids love Popsicles too. We couldn’t really eat ice cream due to my son’s dairy (among other) allergies, so frozen fruit treats were the way to go. Occasionally, I’d let them indulge in some sugary ones, but most of the time, the ones made from real fruit juice filled my freezer. Have you seen how expensive those are though? I can understand why, 100% organic berries and natural sweeteners would be more pricey than fruit flavored sugar-water. 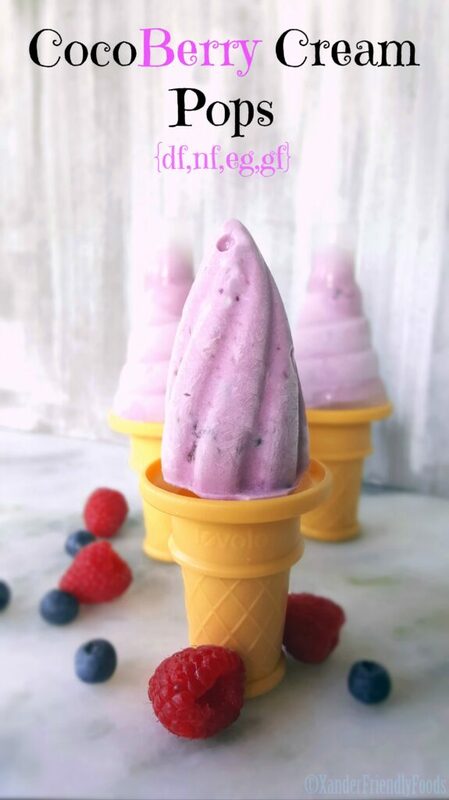 So, I started making my own, and I’m going to show how to make your own Berry Popsicles, using only 4 ingredients. Of course you can always buy them, pre made, but making them at home will save you money, let you create your own flavor combinations and provide your family with a treat that is actually good for them. Start with the berries, whatever kind you like. My freezer is stocked with bags of blueberries, strawberries and berry fruit blends and any of those will do. 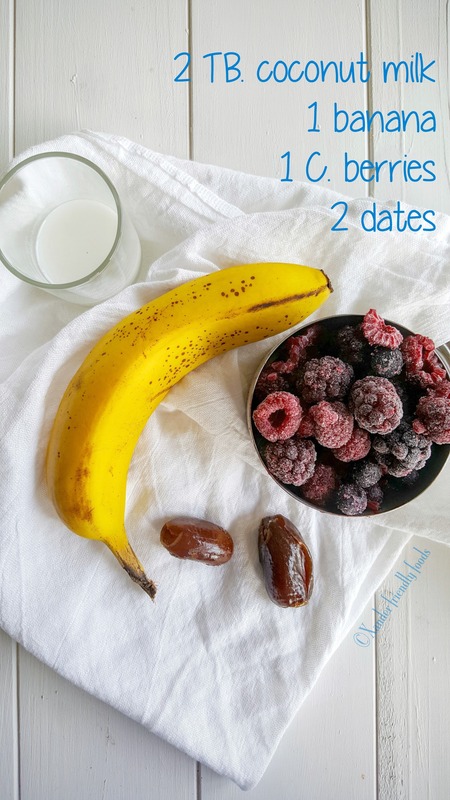 You’ll also want to grab a banana, a few tablespoons of non-dairy milk (I use coconut milk) and 2 dates. Throw those into a blender and blend away until it becomes a thin smoothie consistency. Do you have your Popsicle molds handy? If not, you’re gonna want to bring those out now. 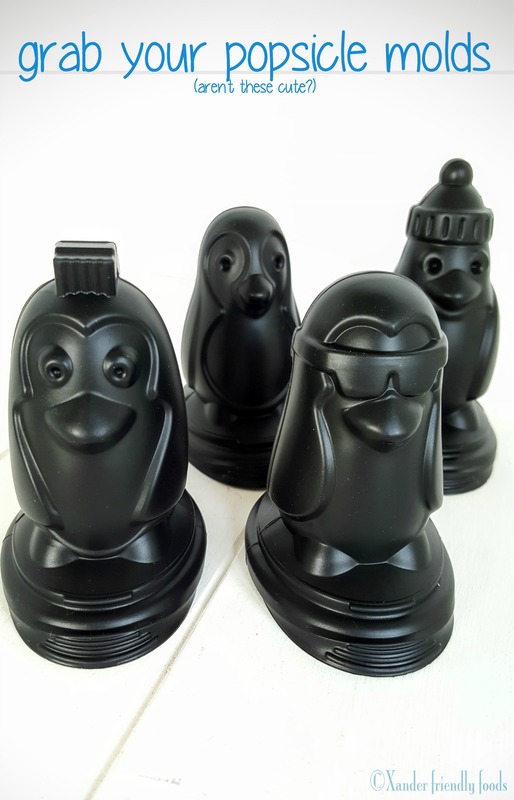 They come in all shapes but my favorite so far have been these adorable penguin molds by Tovolo. I just happened to run across these on Zulily and just had to pick them up for my son Xander, whose favorite animal just happens to be a penguin. 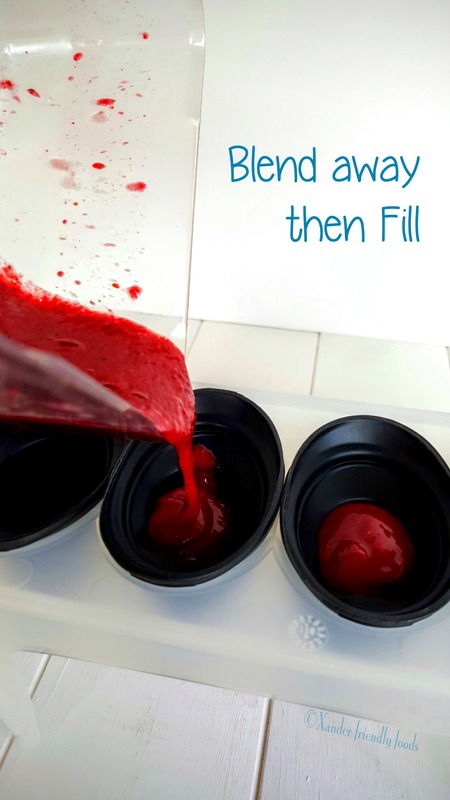 Pour your blended berry mix into your popsicle molds. Be careful not to overfill, you’d hate to get mashed berries everywhere. Then add your popsicle sticks. 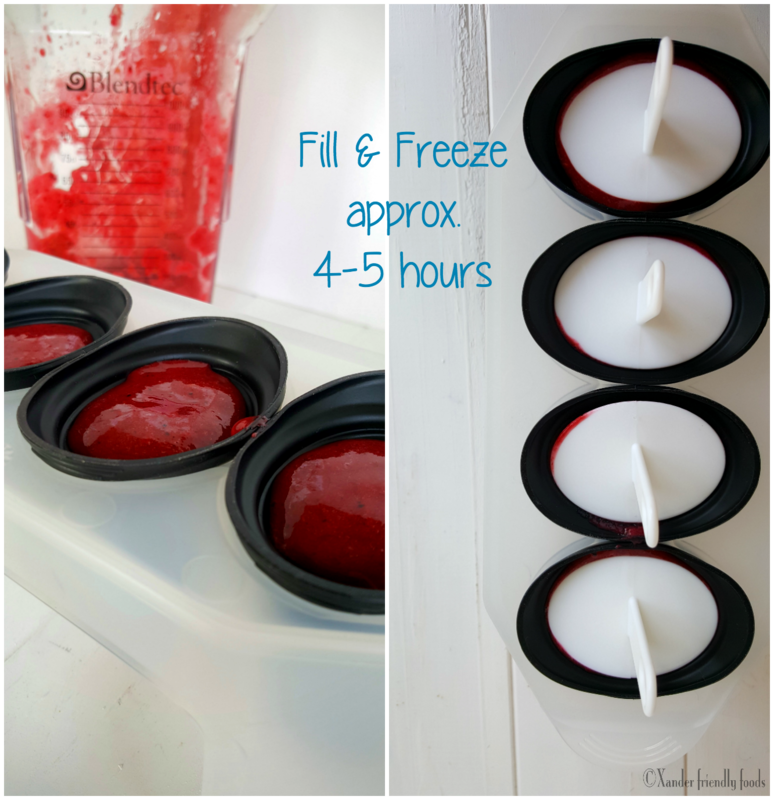 Find a flat surface in your freezer and place those popsicles in there for 4 hours minimum. I’m pretty sure that waiting is the hardest part of this whole recipe. 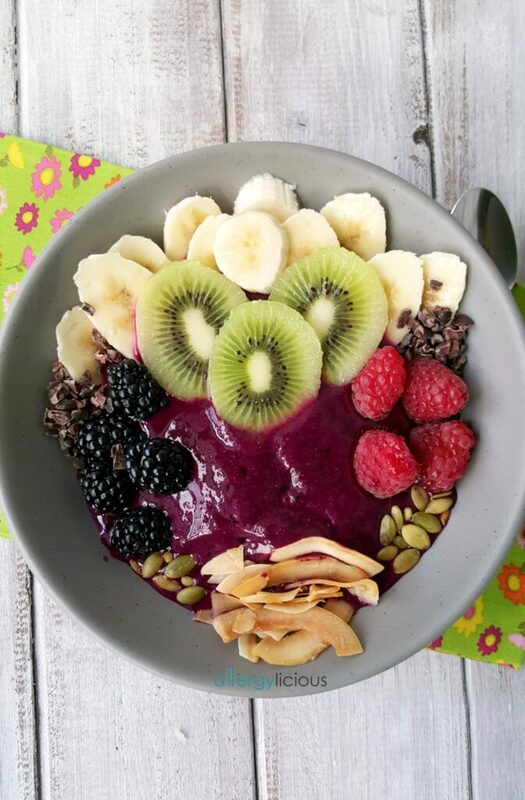 If you just can’t wait, forget the molds, grab a bowl and add some seeds, cacao nibs, coconut & more berries and this can be your smoothie bowl. But…..if you all are as patient as myself (insert sarcasm here), then we’re going to wait this out and let the kiddos enjoy these treats. Maybe if they are in the sharing mood, they’ll even leave one for you! In a blender, add all 4 ingredients and blend until smooth. Add a boost of protein by adding some protein powder to your blender. Don’t shy away from flavor, add some orange zest, lemon juice or even a little ginger juice for a little more fun. What was your favorite frozen treat as a kid? Were you a popsicle fan or was ice cream your thing? Have you ever made your own frozen treats and if so, what’s your favorite flavor combination? Haha, o my gosh! I want those molds! These look delicious, and those pop molds are over the top adorable! They are by far, my fav! Those are SO cute!!!! I love the little characters. We do a lot of popsicles here in summer. Breakfast is a great popsicle meal!! We do pops for breakfast too! It’s a way to change things up. Thanks Aimee! It was a great find for sure. Oh, those are so cute!! I have boring popsicle molds…I’ll have to find something like this…my kids would love it! My favorite frozen treat as a kid were ice cream sandwiches, and I still love the vegan ones from So Delicious. Plus, they are treat-sized, which I like. Your berry popsicles sound so tasty! Those are so cute! I bet that makes the recipe even more delicious! 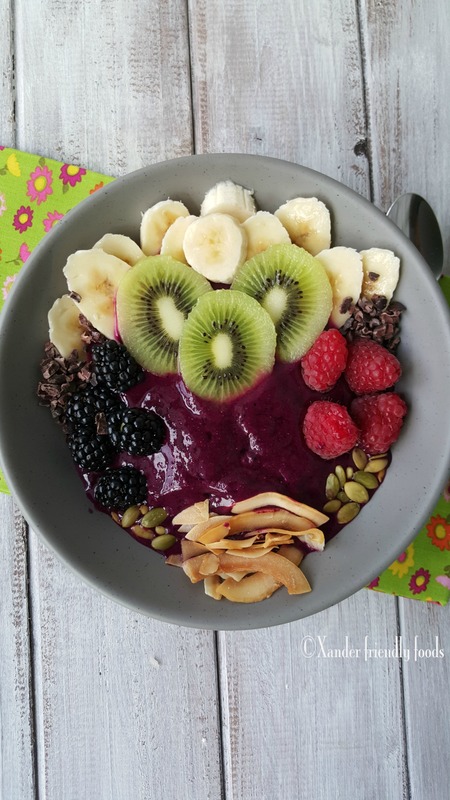 These look so adorable and the ingredients are amazing and so much healthier than the crap at the store! So delicious! Love the bright red color! Thanks, those berries made it the perfect bright red. And I agree, these are sooooo much healthier than all garbage treats in the store! Thanks Mel! Those molds are so fun. Thanks Sina! They are a favorite with the kids for sure.